What followed was a nice conversation that covered the obvious and not so obvious. “It helps to have a knack for math and science,” I said. “Engineering school is tough, so focus and self discipline are also required,” I continued. Then I dove into a less often discussed area, how continuing improvements in communications and information technology are fueling global competition. But who doesn’t know that, right? What many don’t know, however, is that this has opened the playing field wider than it’s ever been before, pitting engineers educated in the United States against their foreign counterparts and thereby driving the demand for U.S. trained engineers down. It’s not just customer service centers that are experiencing mass migrations to foreign shores. “Global outsourcing has hit the engineering field hard,” I told him. The net result is that profit minded businesses in the U.S. are often opting to contract engineers, both domestic and foreign, on an as-needed basis rather than pay to acquire them as full time employees. Once the decision to contract rather than hire has been made, the next unit in the equation of profitability prompts the question, “Should we give the work to an engineer residing in the U.S. or one who lives abroad?” Often this is the defining question which then leads to the decision to work with engineers residing on foreign shores. Their cost of living is lower, and they’ll work for lower wages. It’s as simple as that. What had up until that point been a pleasant conversation quickly took on the dark mantle of frank reality. I wished him luck in his career plans and our conversation ended. All this got me thinking about Daniel Pink’s book, A Whole New Mind: Moving from the Information Age to the Conceptual Age. In a nutshell, Mr. Pink suggests that engineers who tend to think with their right brain lobe more than their left will be more likely to be in demand in the U.S. Never heard of the right-brained versus left-brained thinker? Read on. Science has found that those who are dominated by left brain thinking tend to lack “peripheral vision” and business sense. They’re content with crunching numbers in formulas and cranking out massive amounts of tedious work, activities which don’t require much creativity. Innovation and thinking outside the box just aren’t their fortés. In other words they’re good worker bees, and this, unfortunately, makes them virtually interchangeable. Advances in technology have made it easier than ever to replace left brained engineers with computer software. 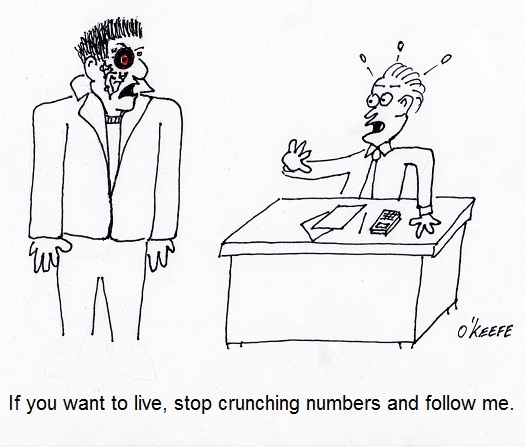 Many operations can be reduced to plugging numbers into software, which then spits out answers. And thanks to advances in telecommunications, it has become easier than ever to outsource the left brain dominated engineers’ formula-driven activities to other countries where the pay scale is lower. Right brained people, on the other hand, tend to be artists and inventors. Science pegs them as being in tune with the big picture, including business savvy skills like innovating and synthesizing, developing strategies, managing projects, and leading others. Einstein made the observation that true genius lies in creativity, and he could add to this statement that it also goes a lot farther to guarantee job security. So until we can invent a true thinking computer, you know, the Terminator type, engineers and other professionals who are required to use right brain skills will enjoy a greater degree of job security than their left brain dominated counterparts. Can someone overseas do my job cheaper? Can computer software do my job faster? Is what I offer in demand, in an age of abundance? Answering yes to any of these could be hazardous to your long term career goals. Many dangerously loud sounds are not so easily controlled, as when they take place in industrial settings. Here, when complex machinery and manufacturing processes are at full tilt, one can’t just turn a single knob or pull a plug to gain relief. Controlling sound levels in factories, power plants, and construction sites is often a complex task, relegated to engineers with state of the art equipment meant to measure and assess sound exposures in order to devise a strategy to control them. Let’s take a look at a few of these control methods. For our example, we’ll consider the challenge faced by a fictitious company, Widget USA. Business has picked up, and they need to install an additional manufacturing line in their factory. Now widget manufacturing machinery is notoriously noisy, and management is thinking ahead about protecting widget line workers from potentially dangerous sound levels. Their manufacturing engineers dutifully keep this in mind while devising their requirements specification, a list of “must haves” routinely included in quotation requests to potential manufacturers bidding on the job. Of utmost concern is to limit the number of decibels (dB) that the new widget machine can produce. If a manufacturer under consideration is unable to meet these requirements, Widget USA will take their business elsewhere. This methodology essentially nips the excessive noise problem in the bud, eliminating the noise source before it is introduced into the factory, and this is by far the best way of dealing with our scenario. Well suppose things aren’t as neat for Widget USA. Their factory contains many existing manufacturing lines with old, noisy machines. Sure, they’d like to replace them with newer, quieter ones, but there’s a problem, and it’s one all-too familiar to most companies: the expense involved. How can they most effectively deal with this situation? Perhaps Widget USA can modify their existing machinery, or perhaps their overall noise reduction objectives can be achieved by simply replacing worn parts that have a tendency to vibrate. If this measure isn’t sufficient, perhaps sound barriers can be introduced. Whether these are installed around entire machines or parts thereof, they are often effective at absorbing excessive noise. Barriers such as these are made of materials like plastic foam and mass loaded vinyl (MLV) which serve to muffle sound waves. Yet another approach to noise containment is to provide workers in the vicinity of the machinery with sound-absorbing personal safety equipment, ear plugs and the like. If the noise present is loud enough, perhaps a wall, reminiscent of the type often built along stretches of populated highway can be erected. Yet another way to deal with undesirable sound levels is to divert the noise to a location not normally occupied by humans. This is the tact often taken with industrial boilers. Their highly pressurized steam expands so rapidly it can create a deafening roar, and engineers often design piping systems which stem from the safety valve on the boilers themselves up to the roof of the building housing them. In this way the steam and its accompanying noise is safely redirected outside, where only the birds passing overhead will be bothered by it. This wraps up our discussion on sound, its measurement and containment. Perhaps you’ve learned a trick or two to help alleviated unwanted sounds in your environment, whether it’s produced by your teen or your neighbor’s leaf blower. How many crickets clicking their legs together in unison would it take before we would suffer hearing loss at the sound exposure? Would we need to sit in a garden filled with millions of them all night long, only to discover in the morning that we could no longer hear the tea kettle’s whistle? The chart below may not provide the answer to this question, but it does provide some very good examples of different sounds and the point at which they become hazardous. So how do we know where we’re at safety-wise with sound pressure levels and exposure times? This question wasn’t pondered until the 1950s, when the military, specifically the Air Force, provided the first standards in this regard in 1956. This initial action was followed up by numerous studies and standards committees wrestling with the issue. It wasn’t until 1981 that the Occupational Health and Safety Administration (OSHA) required employers to implement hearing conservation programs for employees in certain noise-filled environments. What surprised many of the first scientists studying the impact of sound is that sounds don’t necessarily have to be initially perceived as “too loud” in order to cause hearing loss. 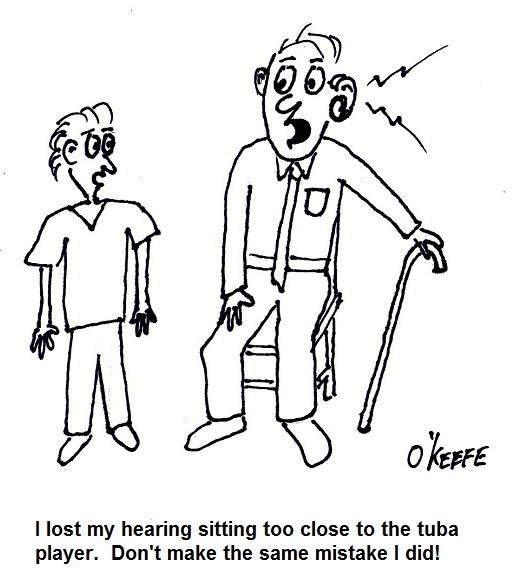 Many sounds that we perceive as easily tolerated can in fact cause hearing damage if exposure is long enough. So what’s “long enough?” Title 29 of the Code of Federal Regulations, Section 1910.95, lists the OSHA permissible sound exposure durations at various sound levels, as shown in Table 1. Just to put things into perspective, a small chain saw tearing into a log typically produces sound at 90dB, or 90 decibels, which you will recall from last week’s article is the measuring unit used for sound. And that noisy truck clattering down your street, the one that your dog can’t help but bark at, can produce 100dB. The guy standing on the airport tarmac directing your plane into the gate can be exposed to as much as 150dB. There’s a good reason he’s wearing ear protection. Let’s take a closer look at the information provided in Table 1. It states that you most likely will not suffer hearing loss if you spend up to 8 hours in a place where the sound level does not exceed 90dB. Comparing that information to Table 2, which is specific to noises produced at a power plant, we see that this sound level is produced by the typical steam turbine. where C represents the total time of exposure at a measured sound level, and T represents the total time of exposure. T, which in our example stands for “hours,” is found in the left column of Table 1. Based on scientific studies of sound’s effects on the human ear, if the TWAN is greater than 1.0, then the exposure exceeds safe limits. Let’s find out if a worker in a coal fired power plant is at risk of losing his hearing during the course of a typical eight hour workday. Table 2 shows the different noises he has to contend with during that time. Since 1.18 is greater than 1.0, we see that the worker’s noise limit would indeed be exceeded. He would need to either wear hearing protection or limit his exposure time in order to comply with OSHA regulations and protect his hearing. 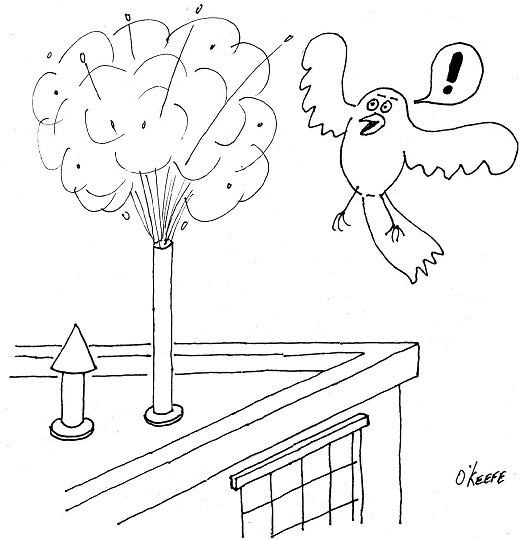 Next time we’ll discuss options open to us to control sounds in our environment. Hearing is one of our most valued senses. It, along with sight, is how we acquire most of the information available to us in our environment. But have you ever considered what sound actually is, or how it is perceived? Sound, at its simplest, is a series of pressure waves traveling through a medium, whether that medium be a solid, liquid, or gas. Now let’s focus for a moment on the medium we’re most familiar with, which, unless you live underwater, is air. The last time you turned on the radio, I’ll bet you didn’t consider what makes it possible to hear sound coming from that box. How does that magical fete happen? Well, turning the knob on the box results in the amplification of electrical impulses produced by incoming radio waves broadcast from the radio station. These impulses power the speakers, causing them to vibrate. The vibrating speakers in turn create pressure waves in the surrounding air, and those waves will travel until they crash into an obstruction, such as the workings of your inner ear. At this point the magnificent human body comes into play, skin, bones, and fluid working together to convert the action of the pressure waves from your radio’s speakers into nerve impulses which find their way to your brain via your nervous system. Your brain interprets these nerve impulses and perceives them as music. If sound pressure waves are strong enough, they can crash against the workings of our inner ear and create damage. Damaging pressure waves can be created by things like sitting too close to the massive speakers at a rock concert, or a jet’s engine, as well as by many types of machinery present in a factory. In most cases hearing can be preserved by wearing appropriate protection, coupled with limiting the amount of time you are exposed to the loud source of sound. Both of these factors are important, as we’ll discuss later. where Lp is the sound pressure level in dB, p is the measured sound pressure, and as discussed previously, the threshold sound pressure, p0, equals 0.00002 N/m2. If you will remember from previous blog discussions, Log, a standard function on most calculators, is used to scale down the sound pressure level numbers, which tend to be quite large, into smaller, more evenly spaced numbers, making them easier to plot on a graph. Now bear in mind that 20 N/m2 is the level at which most people’s ears will start to hurt. Prolonged exposure at this level can cause damage to the ears and hearing loss. Depending on your exposure time to a sound source, even much lower sound pressure levels can lead to hearing loss. So how do we know where we’re at safety-wise with sound pressure levels and exposure times? Next week, we’ll find out when we look at exposure standards set up by the Occupational Health and Safety Administration (OSHA).